When the Camelot Internet Phone and VocalTech software came out in 1995 I was hooked on Voice over Internet Protocol. Phil Zimmermann's PGPFone brought encryption to VoIP 10 years before Skype but none of these modem delivered technologies were ready for the Internet as it was then. Now with broadband multi-megabit pipes (or is that a series of tubes?) along with services like those above as well as Vonage and beyond have the bandwidth and quality of service required to send voice traffic at a quality near that of the plain old telephone service (POTS). But these still have their own problems while POTS is a more stable product that has been around for the last 100 years, that's a lot of debugging time. Thanks to the instigation of my buddy Matt Deatrick, I have been building systems running [email protected] for a little over a year and their capabilities are mind blowing. 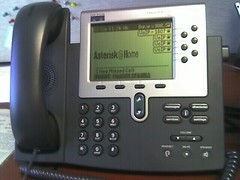 No longer are you tied to a proprietary phone system and the hardware base of the switch vendors. You are free to setup forwarding, linking and automated scripts to your heart's content. This system is not for the faint of heart, but chances are that you have a no-longer-used, sub-gigahertz PC at your feet below and have just the amount of curiosity that it takes to tinker with one of the most powerful telephony applications on the planet. I'm only upset that the bugs that were fixed in [email protected] didn't make it into the 1.0 and even the 1.1 version of TrixBox. If you can; go with an @Home distribution with FreePBX until 1.2 gets rid of these silly daemons. More info on setting up your own Asterisk box can be found in my PC Magazine story here: Your Virtual Assistant.